So I went almost a week without blogging, then the 4th of July happened, and now it’s the weekend. Now I can catch up with some blogreading, and perhaps I’ll share some of the things I find with you. Perhaps I’ll even share some of my own thoughts about this past week. Let’s start, shall we? Cliff Chiang is an illustrator and comics artist whose style I like very much. His style is an interesting mix of subtle realistic touches and interesting graphic touches. Take a look at some his commissioned sketches from Heroes Con. Also in comics and fine art is the flickr stream DECONSTRUCTING ROY LICHTENSTEIN. I am a big fan of Roy Lichtenstein, and have been since I was a teenager, and this is the kind of wonderful resource that the internet enables. I’ve been thinking a great deal about how the internet inherently changes things like scarce information or difficult connection. Jason Scott has a thoughtful, deeply personal post about his own fanhood, obsession, appreciation for The Art of Noise. His description of always seeking Art of Noise product at every record store he went to resonates with me. That means I DID THAT TOO. Not for The Art of Noise, but for Talking Heads, New Order+Joy Division, They Might Be Giants, and the like. The last bands I did this over were Christina Aguilera and Frank Zappa. Of course now Tower Records went defunct, and record stores mean almost nothing. It’s an entirely different world of music and fandom. My the media I consumed in my teen years and early twenties would have been entirely different had I had ready access to the utilities and fansites and retail venues on the internet. Once again I’m reminded that we live in this future. Audrey Kawasaki has a new print called Okimiyage, and in her post about it she includes some closeups and photos of the process of getting it made. Check out this post about the printing process as well. Comics blog “The Beat” notes that Kansas City Barbeque, in downtown San Diego, burned. Big bummer! The post on the KCBBQ website is pretty heartbreaking. Another post on The Beat is R Stevens goes back to sticks with the web, about Diesel Sweeties moving away from print after moving toward it. Sounds like being a webcomic can be an end unto itself. More art and process: go visit PUMML: Artblog of Drake Brodahl. He is doing some wonderful work, and I intended to mention his own post on process some time ago. So now I am. I’m not vegan, but I like the idea of a Vegan joint map of Los Angeles. I had no idea that the Boys & Girls Club Gym here in Moorpark was damaged beyond use, but I’m glad it was repaired: Club gym opens after 6 months of repair . I’m also happy to see that the Moorpark Acorn moved to color photos on the web. I still don’t read the print version. This vintage ad for Brylcream is awesome. Cubecraft has paper models you can print and assemble into many cool characters. I like MODOK, Dr.Zoidberg, Dr. Manhattan, Mario, and The Prince from Katamari Damacy. Did you notice that after a long hiatus, Leah blogged? Nice to have her post again, if only for a minute. Doc Searls, a person who I look up to as a blogger, has been blogging about the Gap Fire. He’s also twittering the gapfire at twitter.com/dsearls. 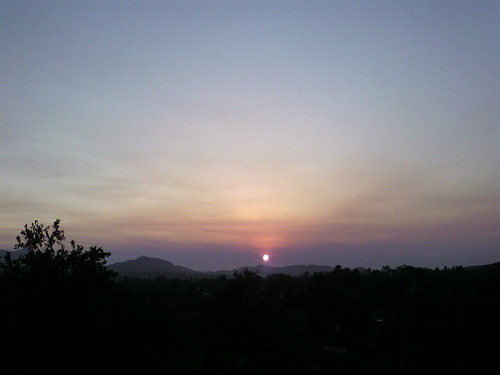 The sunset when viewed from Thousand Oaks last night was very pretty — I think partially because of particulates from that fire. When Jason Calacanis criticizes Nick Denton, that’s noteworthy to me. Background: At one time, I thought I wanted to be one or both of these men. Now I don’t. I’m no blog impresario. Unlike Charles Foster Kane, I don’t think it would be fun to run a newspaper. I also think Rachel Maddow is super-awesome. The other day I got a comment via email about Evil GIFs: Partial Same Origin Bypass with Hybrid Files is a taste of the nastiness that’s available. via Simon Willison. Joe Crawford blogged this at 5:08pm in 2008 in July. The 5th was a Saturday. You are reading this 11 years later. Comment. There is one comment Tweet. Send email. It has hashtags→ misc movies politics programming webdev . from Aguilera to Zappa… that is why YOU, my friend, are awesome.